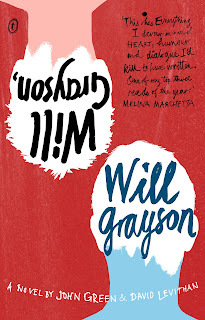 Will Grayson,Will Grayson while not my favourite John Green book was one I thoroughly enjoyed. The story is spilt into 2 different perspectives, one by John Green and the other by David Leviathan. At first I thought i'd have trouble identifying which author was which but once I was introduced to both Will's they were easy to spot. John's Will was just trying to survive high school with the help of his friend (who I loved) Tiny. This Will brought a lot of humour and wit, that I so love John Green for always delivering. While David's on the other hand was quite dark and surprised me with the depth that was given. He was written to be someone I could easily sympathise with and although depressed I found he could be humorous at times. I also noticed that while reading Will 2's chapters, there were no capitals and I think that helped portrayed the sense of emotion. WG WG was great collaboration, the stories of the two Will's intertwined perfectly and each author brought something to the story. While at the beginning not particularly hooking it was worthwhile. Will Grayson, Will Grayson while a mouthful was a light read that I can only really explain as"Uplifting" and a huge element in that happiness was Tiny Cooper. Tiny Cooper was the best of them all, he was confident with who he was and accepted his flaws. His ulterior motive was to make to make people happy and because of that, he made me happy. Anyone who strives to make others happy in this life is ultimately a character I love. It's amazing because in so many other situations Tiny would be a prime victim to bullying, he is the gay guy who writes musicals about his life story. But did that stop him, hell no!! And for that, "I appreciate you Tiny Cooper". I loved the ending to this story because while there were questions unanswered it was such a great ending. I can't explain it without giving anything away, but it just filled me with happiness. This was a awesome collaboration and a well done contemporary. Stick to it, because in the end it's a worthwhile read with a great message on acceptance and love. And a great break from all that heavy or required reading. WORLDS KEPT THEM APART. DESTINY BROUGHT THEM TOGETHER. Aria has lived her whole life in the protected dome of Reverie. Her entire world confined to its spaces, she's never thought to dream of what lies beyond its doors. So when her mother goes missing, Aria knows her chances of surviving in the outer wasteland long enough to find her are slim. Then Aria meets an outsider named Perry. He's searching for someone too. He's also wild - a savage - but might be her best hope at staying alive. If they can survive, they are each other's best hope for finding answers. Ok this might be a little foggy and quite short because I read this around April and didn't write too many notes. Under The Never Sky was also a read that didn't grab me from the beginning but once I got to a certain point, I couldn't stop. My expectations were very high and I didn't want to be that one who didn't like it. But while my expectations weren't met it was still a great read and different from what I expected it to be. I heard that I was going to love the romance but I felt like there was too strong a hatred for it to suddenly turn into love. It seemed to me that Aria was being ungrateful and Perry was portrayed to be this filthy savage. I wouldn't call it insta love because they certainly didn't start out with any good impressions of each other but when it did happen it was a bit rushed. The love did just suddenly appear after all these fights and disagreements but it was a romance I did turn to like. I think that as the romance blossomed both characters became more likeable and strong. And at the end of the day I have to commend Aria for her strength and Perry did start to grow on me. It came to a point where their moments were some of my favourites.. but I felt it took a while to get to that stage. I was a bit confused at the beginning with the whole smart eye thing, and I still haven't fully grasped it. But I think it's a piece of technology that we will see more of in futuristic dystopians. I loved Roar and Talon and the relationship that Perry had with both of them, were ones I loved. Roar was a character I could see myself falling for and I wanted to hear more of his backstory. This seems like a negative review but I did actually like this book. I got to a point where I took it everywhere and I wanted more. I'm not rushing for the sequel but I am very anxious to see where things go in book 2, so a copy would make me very happy. Under The Never Sky is something I would recommend and in the end these flaws didn't stop me for enjoying the overall novel. Great reviews. I really wanna read Will Grayson Will Grayson or any John Green book coz I feel left out. I'm still waiting on that reservation! 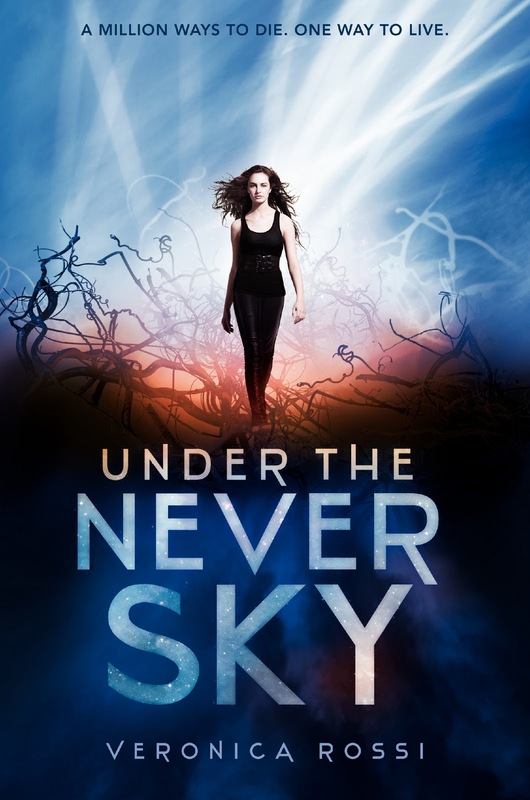 I have Under the Never Sky on my TBR pile, so I'll have to read that one soon. Thanks for sharing! I haven't finished WGWG :( The characters are fine, but the plot didn't really grab me so I stopped reading it... I might come back to it later though cause -- you know -- it's John Green and perhaps I just wasn't in a good mood. I've been wanting to read Under the Never Sky. Heard so many good things about it and now you too! ;) I like the title too. Two books that I enjoyed as well :) So glad you liked them! Tiny was a great character, He made me smile :) That's the only John Green book that I have read. and I can't wait to check out Through the Ever Night. Great reviews! Great review! And I love your cover of Will Grayson, Will Grayson. Which version is that? I adored UTNS when I read it so I'm glad you enjoyed it! Like you, I also got a little confused at the beginning - and, because of that, I was sure I wouldn't like the book! - but I stuck with and am so glad I did because I ended up loving it! I really need to read Will Grayson, Will Grayson. I also gave Under The Never Sky four stars. Great reviews, glad you enjoyed the books!